I learned today that not every recipe is going to be a win in our house. I’m not sure why that is: but it just is. Sometimes it’s because I made potato salad with Greek Yogurt and it tasted like nothing. Well, scratch that: it tastes like dill because I flavored the sauce with it. I do have to thank my lovely friends for eating it: but, next I am going to make full fat, full flavor potato salad!! Today, I made one of my recipes from the “Taste of Home” bounty my Grandma Jo gave me (along with three cucumbers, and some green beans). 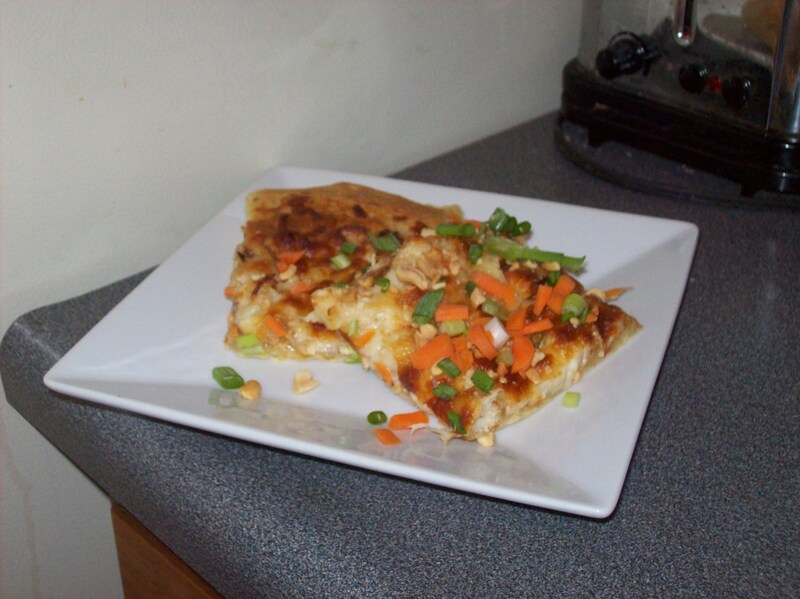 The recipe was for Pad Thai Pizza. It was, and is, all that I good recipe ought to be: and I will post it. however, I learned two things today. The first thing I learned is that some pizza SHOULD be on thin crust, and this is one of them!! Which leads into thing 1.2 that I learned: don’t alter a recipe until you’ve made it at least once. Lesson 1.2 probably won’t be followed precisely…. given the fact that sometimes you have to add a jalapeno to something…. or it just needs a little love, like crushed pecans. The second thing that I learned today is that I just don’t care for pad Thai. I think that I have known this, but the man loves it… so I have tried to love it too. But, my relationship with pad Thai is not working out! We met one time in a restaurant…. I thought it was okay. Then, I tried to make it at home… and I thought it wasn’t worth the effort. And, finally this pizza: well, I just finally saw the light. We’re going to have to break up…. and the husband will probably have to eat the left overs. Today’s lunch was Pad Thai Pizza! The above picture is with my preferred pizza dough recipe, but I would suggest either using the suggested store bought pizza dough in the recipe…. or making a thin crust! Roll out dough in 15x10x1 pan, bake for 5-6 min til slightly brown at 425 degree. Whisk PB, teriyaki, chilisauce, and honey. add half to chicken, toss to coat. Spread remaining sauce over pizza crust.Top with chicken & cheese. Bake 10-15 minutes until golden brown. Sprinkle with remaining ingredients. Enjoy! Please, I feel bad for not. i thought your potato salad was delightful. seriously.